The CST/berger 06-816 is a rugged oval-shaped rod which is waterproof, corrosion-resistant and features an abrasive-resistant coating with special reinforcement ribs to stop breakage and add stability. 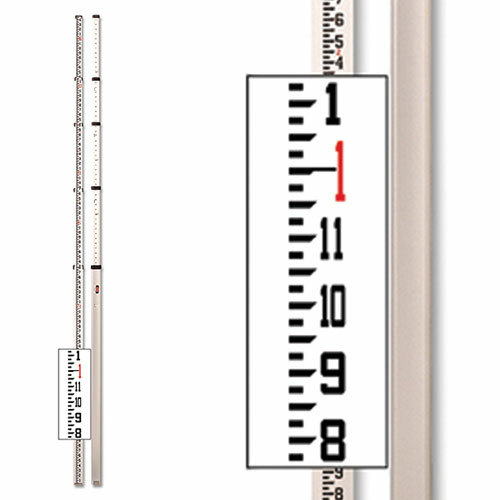 Easy-to-read graduations and a special measuring scale on the backside permit users to read height at eye level, and gradations are imprinted on rod with special weather and corrosion resistant inks. Rod is equipped with reliable polycarbonate buttons that lock each section. Available in Feet/Inches/8ths (06-816C), or 10ths/100ths (06-816).